There is a new video showing the newest features of SAP’s UI theme designer available as of September 2017 on SAP Cloud Platform. The major topic is the theme lifecycle and integration of custom themes on SAP Cloud Platform. You can now save custom themes directly on the SAP Cloud Platform account. There is no more export/import necessary to use custom themes e.g. for a SAP Fiori launchpad site within SAP Cloud Platform Portal. 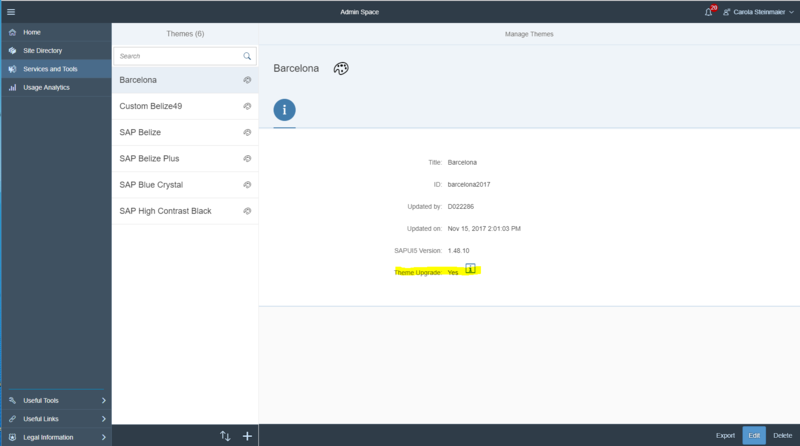 On the start screen you can see more details of a custom theme, such as the status related to publishing, the SAP UI5 version and if the theme is registered within the Theme Manager for usage on a SAP Fiori launchpad site. and check the Release Notes. how will core SAPUI5 version changes handled inside the theme repo? Is is possible to let the theme automatically be compiled against updates in the backend? and therefore i think the theme url needs to support something similar to be compiled a new SAPUI5 version out-of-the-box. Is this something supported or do you have to manually edit theme inside designer and save it to latest version? there is the theming service running on SAP Cloud Platform, which automatically updates the theme, when a new SAPUI5 version is applied. Within the theme manager you can decide, wether the theme should be upgraded automatically. Thanks for posting such informative blog. Can we apply to one particular application in Fiori Launchpad rather than applying the changes to all applications in Launchpad? the theme, which is set in the launchpad, is inherited by all applications called from the launchpad. In principal you can specify a specific theme for an application by using the URL Parameter sap-theme. But for User Experience reasons a common theme across all applications would be the way to get a harmonized and an coherent end user experience.